If the Black Mountain is unavailable or out of stock for some reason, the Fuel Pureformance Deluxe Dip Station is our runner-up. What is a Portable Dip Bar? A dip bar is one of the more modest pieces of gym equipment to be found. It simply consists of two bars that are close to parallel with one another. Don’t be fooled however, it has become a staple in almost every field of fitness. From bodybuilding to cross fit, all types of athletes and normal individuals alike incorporate the use of a dip bar into their workout. They provide a simple yet very effective way to target both the triceps and chest simultaneously. The angled grips allow for versatility depending on what part of the body the user wishes to focus on. In addition, for those with more creativity, the dip bar offers endless possibilities. Being portable enables the equipment to be easily carried or moved, especially because of being a lighter version. What are the benefits of using dip bars? There are several benefits that come with using a dip bar. For one, there is no more hassle involved with getting a gym membership. The bars are versatile enough to provide all the key exercises. Instead of paying ridiculous amounts of cash each month and hauling yourself to the gym every morning, now you can work out anywhere you want. Another great aspect of having a dip bar is the small amount of space they take up. Most pieces of gym equipment are massive and notorious for taking up large amounts of space. Lucky for us, dip bars are usually no more than a few feet wide. They can easily fit into a corner of a room or the back of a closet. This way, any room can be your workout room. No furniture will have to be rearranged to find free space. When you want to workout, simply place the dip bar in an empty space in any room and place it back in the corner or closet when finished and forget about it until your next workout. A dip bar is also extremely cost effective. Most people don’t even consider buying gym equipment for their personal use because of the sky high prices that often come with them. If it is cheap to buy and a small piece of equipment, then it stands to reason that the assembly would be a piece of cake, and it is. Other than a few pieces and a few screws here and there, not much work is needed to put a dip bar together. Again, if you have ever imagined trying to put some other pieces of gym equipment together, it can be quite intimidating. With a simple dip bar, there will be no need for spending hours trying to decipher an instruction manual. What exercises can you perform with dip bars? With some knowledge of general exercises and a bit of creativity, the possibilities of dip bars are endless. Classically, the dip bar can be used for dips. For those that are perhaps unfamiliar with dips, there are actually two forms. When the elbows are kept in line with the bars themselves during a dip, the tricep themselves will be targeted during this movement. However, when the elbows are bowed outside of the handles on the dip bar, more emphasis will be placed on the outer chest. To be sure, the triceps will be worked on any variation of the dip, but some variations place greater emphasis on other areas. A dip bar is also great for working the abs with exercises such as knee tucks, leg swings, and around the worlds. As long as a dip bar is high enough, inverted rows can also be done to focus work on the back muscles. Also, if the user’s abs are strong enough, a variation of neutral grip pull ups can be performed with the user’s legs held straight out in front at a 90 degree angle. As the title suggest, the dip station by black mountain ( supplier ) has a weight capacity of 3000 lbs. It is a simple frame that would do the job really well. The Dip station is incredibly easy to setup – would take you around 5 minutes to assemble. You can grip it well and while performing the exercises, it does not move or shake – It is stable. One of the main factors of this dip station being of the best is the price. Which is significantly lower than another dip bar of equivalent quality.It comes with lifetime warranty. Also, as you can see in the image, there are pads at the bottom which further increases the stability of the unit. The Fuel Performance Dip Station offers all of the key functions of the normal dip station with some bonus features. This product features angled grips which make for a more natural feeling range of motion. In addition, the angle offers users the choice between targeting more of triceps or chest during the exercise. Another great feature of this product for added comfort is the padded grips, which make it easier to hold onto for longer periods. The Fuel Performance Dip Station is a sturdy construction made of steel. The powder coat finish with blue and gray coloring makes for an appealing piece of equipment. User reviews report a simple 40 minute assembly time. An appealing bonus feature of this product is its olympic rings that can hang from the dip bars themselves. This feature gives users a few more options and freedom to perform new exercises. The products modest size and light weight also offer an ease of movement and use. However, some users that are taller may find the lower height to be a disadvantage. Overall, the Fuel Performance Dip Station is an excellent option. Its sturdy build and aesthetic design would please any user. With the addition of olympic rings, its a hard deal to beat. The Yaheetech Heavy Duty Dip Stand provides users with another option that offers some additional features while sacrificing others. At first glance, this product can say a lot about itself. It is built incredibly well and impressively sturdy. It can hold a whopping 500 lbs. of weight. The entire body of this dip bar is made from 2″ by 2″ steel. As with the other dip bar, this one also offers angled grips for comfort and versatility. Unlike the Fuel Performance Dip Station, this dip station is built with the taller and bigger individuals in mind. Height will no longer be an issue with this piece of equipment. This added height also allows more room for alternative exercises other than the standard dip. One downside of this product is the assembly time however. Because it is a sturdier piece of equipment, it requires a bit more time to set up. All in all, anyone looking for a sturdy and reliable dip bar that will fit people of all sizes will surely be satisfied. Another top portable dip bar which is offered in 4 awesome colors. As you can see in the image, it is not a fixed frame. And that gives an advantage of storing it anywhere even if there is little space. 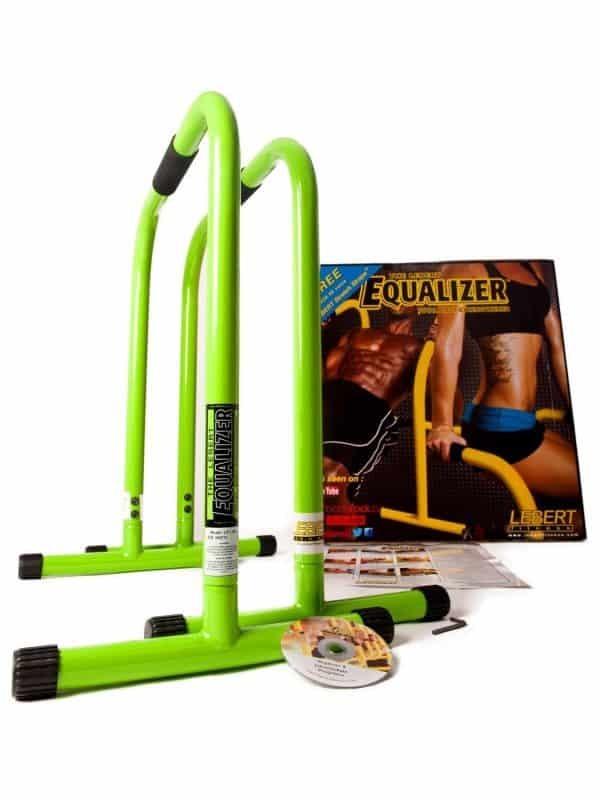 The Lebert equalizer comes with a workout DVD, Laminated Poster, and Lebert Equalizer Bars. It is also lightweight so you can carry it anywhere you want. However, some people do find it difficult to perform dips on these. Perhaps is not suitable for very tall men. Overall, the product is great for women and for medium height men. The Ultimate body Press Dip Stands is another really outstanding dip station. It gets a slightly lesser rating of 4.2 out 5 on amazon ( see current ratings on the official site ). It is easy to assemble and requires no tools. It is stable and light weight too. You can move it around the house easily. Overall, the stand is totally worth the money. 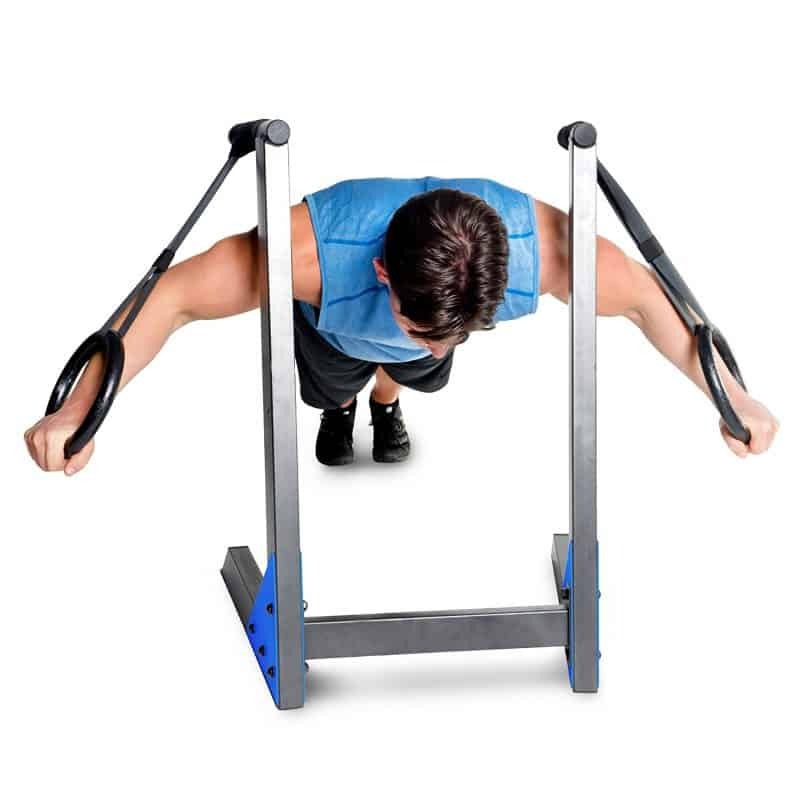 You would take 2-5 mins to assemble and you can perform any exercise possible with a dip stand. Also, it is suitable for people for any height. Complete Guide on the bestselling push-up bars online. Pull up Racks to perform various other exercises – Reviews of the best ones. 1 What is a Portable Dip Bar? 2 What are the benefits of using dip bars? 3 What exercises can you perform with dip bars?